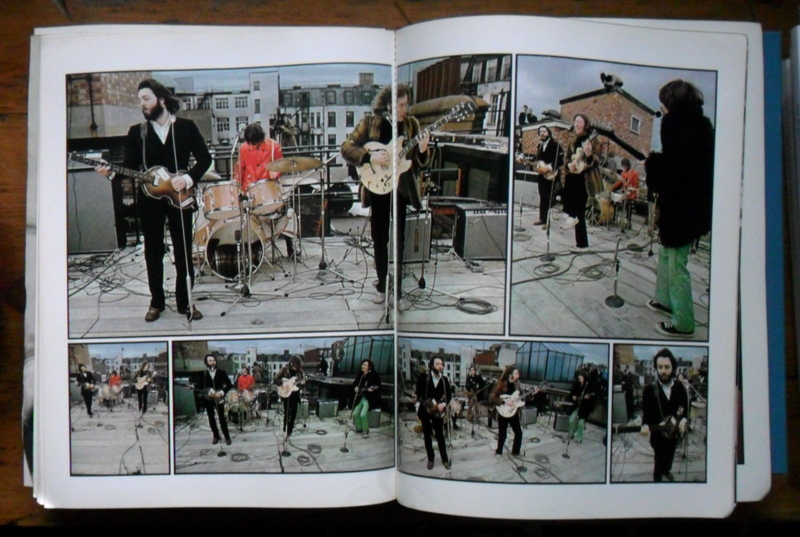 (London, England) – Taking time off from promoting his New Lp, Paul McCartney has announced an upcoming “Director’s Cut” re-issue of the Beatles’ ill-fated fly-on-the-wall documentary, Let It Be. 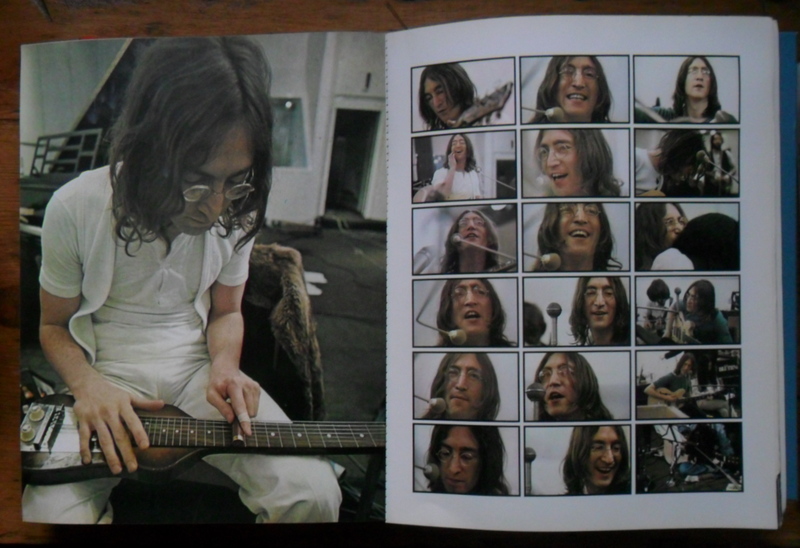 Sir Paul explained the new, fully authorised version of the film was to be “as Nature intended”, and feature only those songs composed, sung and performed by McCartney. 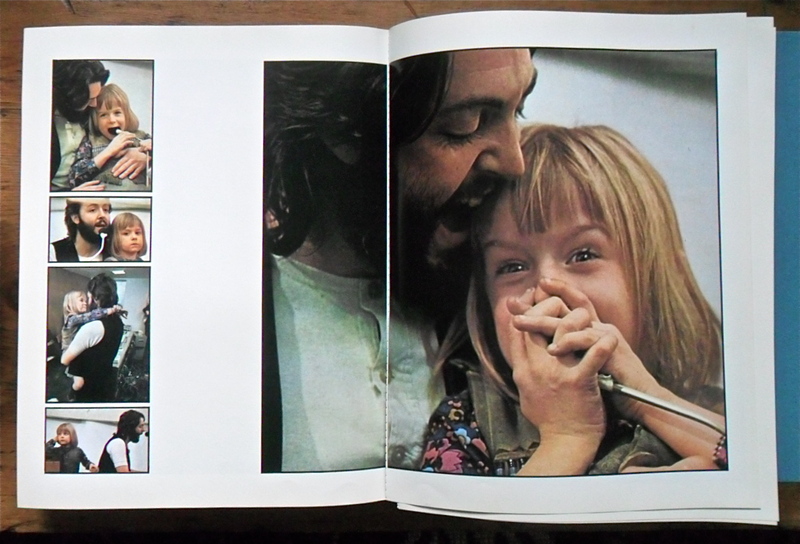 While some of the other Beatles can occasionally be seen blurrily in the background (“Couldn’t be helped without CGI!”), most shots are now either close-ups of a doe-eyed McCartney or cute footage of Paul playing with wife Linda and their children. After the press conference had finished, McCartney continued to upbraid his erstwhile colleagues of over four decades gone by. 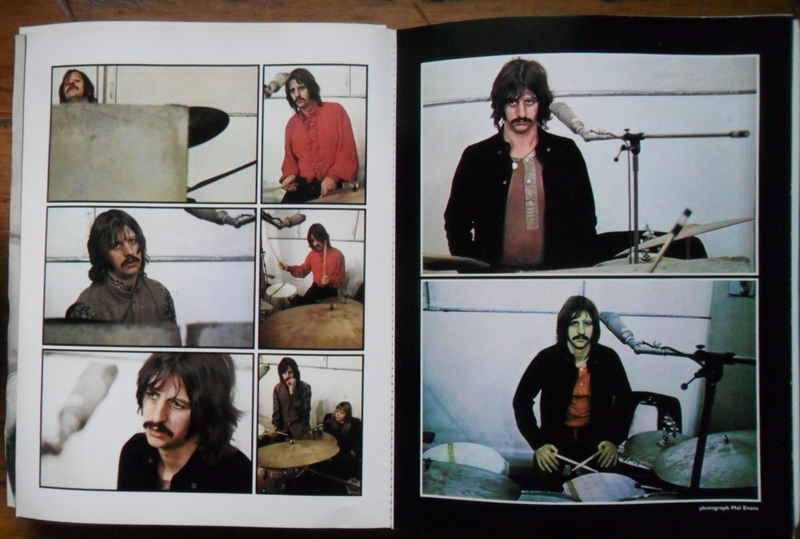 NB: The Beatles Get Back; photographs by Ethan A Russell; text by Jonathan Cott and David Dalton; designed by John Kosh; Produced by Neil Aspinall; published 1969 by Apple; printed in England by Garrod and Lofthouse International Limited. 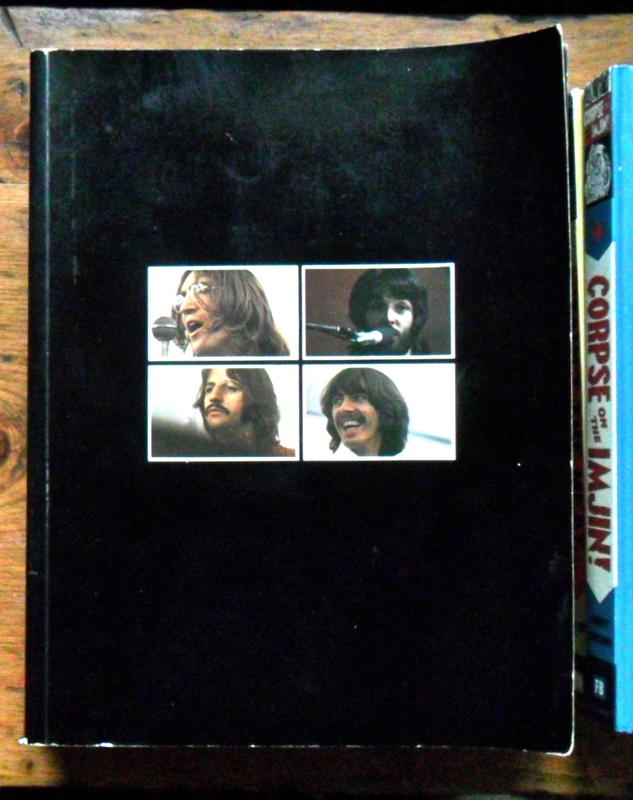 No box or Lp, just the book for fifty pee at Ashford Bootfair two Sundees ago! 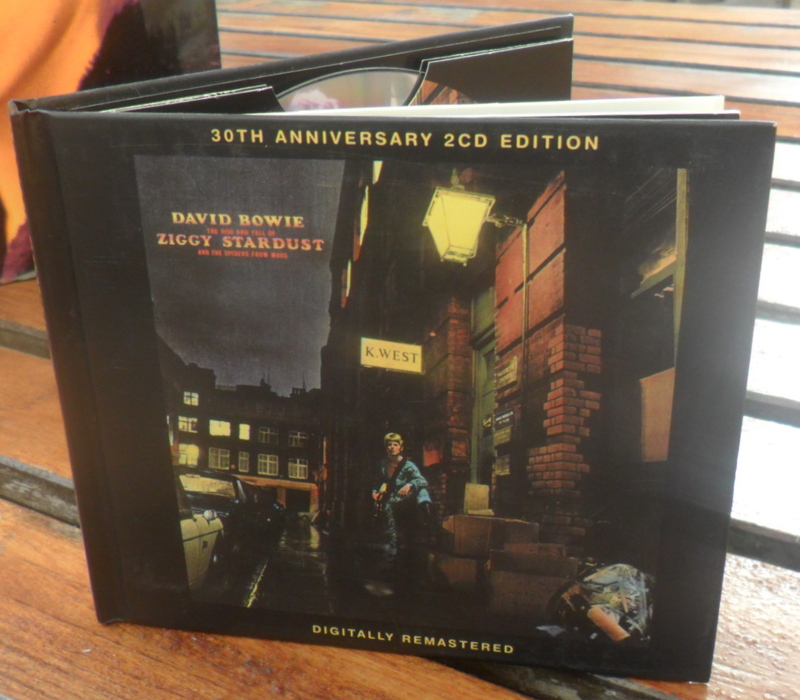 A David Bowie CD drought existed in the late 80s after RCA let them go out of print and before Ryko had re-issued them. I was working at Readmor (sic) Books in downtown Columbus at the time and daily I would see Starman comics. With Pavlovian predictability, I would sing (to myself) the “Somewhere Over the Rainbow”-style octave-straddling hook from the like-titled Bowie hit and fruitlessly resolve to buy it. But it was an itch I couldn’t scratch and Ziggy’s unavailability made him all the more desirable. A commercially shrewd move, for when Ryko did eventually re-release them (with bonus tracks! ), I bought the lot in a pent-up consumerist frenzy. I still have those editions and while their then state-of-the-art packaging, a major selling point 20+ years ago, is no great shakes, they still sound good to me and several of the bonus tracks are available nowhere else. Nonetheless, when this especially nice version of Ziggy presented itself a year or so ago at a tabletop sale in the local Methodist Church I leapt. 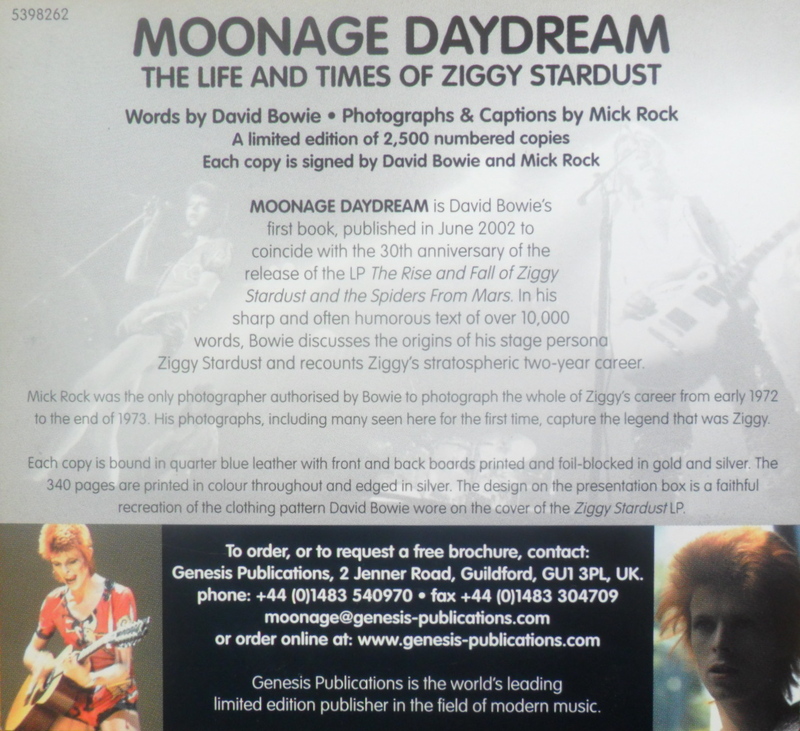 Included in the 30th Anniversary copy was ephemera plugging the deluxe edition of Bowie’s and Mick Rock’s quite wonderful Moonage Daydream, a photographic recapitulation of the Ziggy era. I tend to hang on to such googahs, especially if they don’t take up too much room. 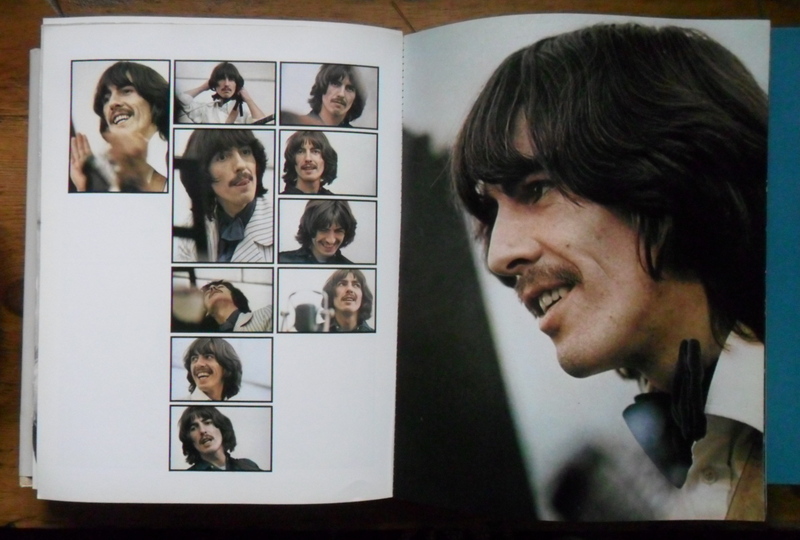 When I pull a record (or CD) off the shelf, often one of these things will fall out to enrich and personalise the experience–as likely as not I’d forgotten it was there. “There was a distinct feeling that ‘nothing was true’ anymore and that the future was not as clear-cut as it had seemed. Nor, for that matter, was the past. Therefore, everything was up for grabs. If we needed any truths we could construct them ourselves. The main platform would be, other that shoes, ‘We are the future , now.’ And the one way celebrating that was to create it by the only means at our disposal. 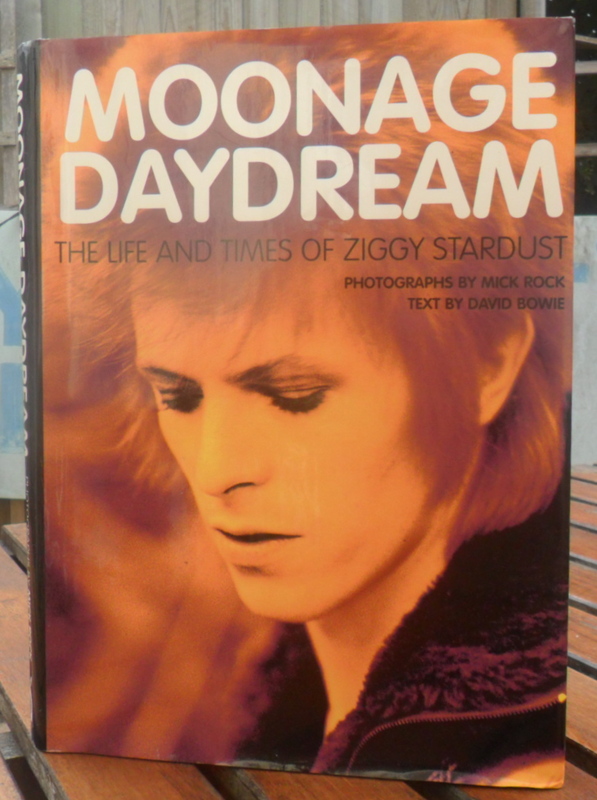 With, of course, a rock’n’roll band.” — DAVID BOWIE Alas, I did not find the limited, signed Genesis copy of Moonage Daydream for £2 at a boot fair in Newquay, but I did get this regular version there. The Psueds Corner-baiting epigram on the back of the book (cited above) sets a tone of heavy pretension and self-seriousness that permeates the tiresome, ersatz music criticism most often heard these days on lightweight radio and TV shows examining works in the official canon of best-albums-in-the-history-of-the-world-ever. I certainly don’t need anyone from Spandau Ballet telling me how seeing Bowie fellate Mick Ronson on TOTP changed his life. 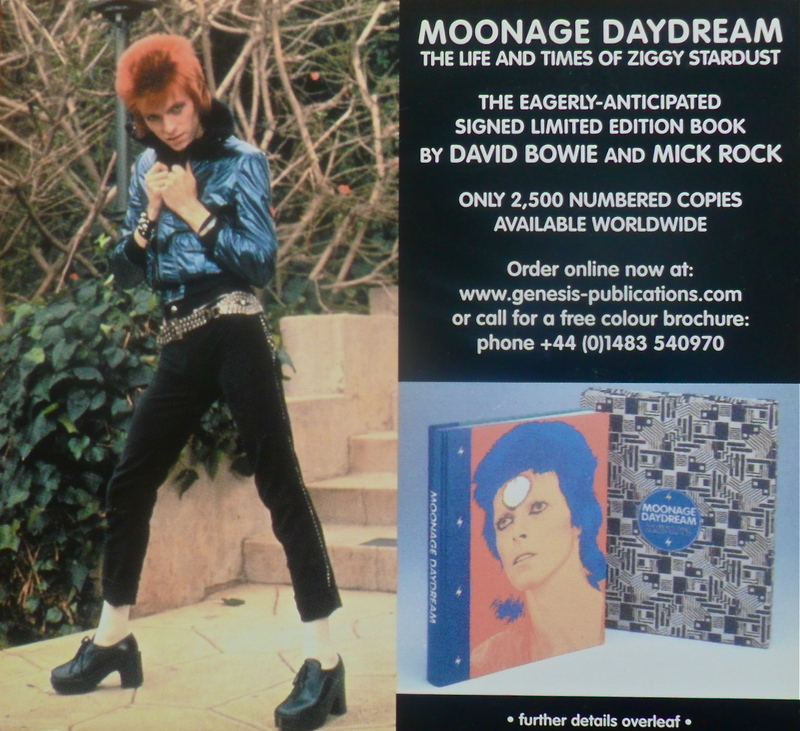 Nonetheless, Moonage Daydream demonstrates the thought and effort that went into creating Ziggy. With hindsight, it was a watershed and a model in this regard. Ultimately though, it’s the music which sells the character, not the other way around, and late last night, as Mrs Asbo and I, merry and slightly weary, tidied up after a pleasant but extended dinner party, the noise of the Spiders From Mars, played at “Maximum Volume” as rich, glorious and catchy as ever it had been, inspired me.